Hand-crafted 10 inch red cedar log home on 16+ acres with log stable, riding arena, caretaker's residence and garage, 40' x 60' pole barn with heated shop and four overhead doors. Three oak-fenced pastures with two automatic waterers, raised bed gardens, orchard, above-ground pool and Hot Springs hot tub make this incredible property a private retreat! 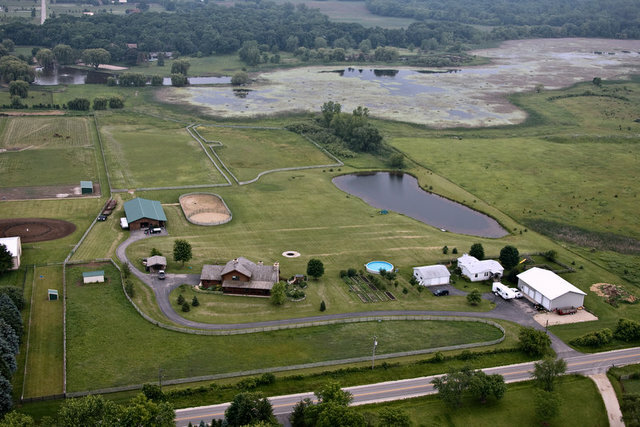 Overlooks hundreds of acres of natural area protected by permanent conservation easement. The lights of Wilmot Ski area dance in the distance on winter evenings. Caretakers residence has 3 bedrooms, 2 baths, family room with fireplace and garage. Log barn is heated, has 7 stalls, automatic waterers, feed room, concrete block wash rack with hot water, fire-separated hay and equipment storage, and sitting room overlooking oak-fenced outdoor arena with a well-drained riding surface. Log stable is served by a second well and has a foundation. 4 field stone fireplaces: living room, master BR, 2nd flr. BR, & rec room in English bsmt.